Fujian is China’s reform frontier but it is also home to the “Child Bride Village”; a shocking, regretful yet long overlooked phenomenon that is incompatible with the province’s high civility. Fujian Law Society’s Research head Lin Dan thinks that Ping Yang village’s illicit adoption of “child brides” will bring about many problems. According to Chinese law, the rights and duties related to foster care and inheritance are valid only in blood relations or legally recognized adoptive relations. In illicit adoption, the foster parents may painstakingly bring up their “child bride”, but she does not have a legal obligation to provide for them in return. As for “child brides” who had looked after their aged foster parents, they could not legally partake in the inheritance process upon the parents’ demise. Fujian Women’s Interests Vice-Minister Guo Yan says, the “child bride” phenomenon severely violates marriage law clauses relating to freedom in marriage, infringes women and girls’ rights, and is a kind of abuse against humanity. Grassroots groups should reinforce the education of “child brides”, especially “child brides-to-be”, and encourage them to make their own marriage choices. Academy of Social Science President Yan Zheng thinks, a lagging local economy is what caused “child brides” to exist and the solution is economic development. It is a top priority that society focus on this special group and help these “child brides” find their biological parents. “Child brides-to-be” should be encouraged to freely find their love. A little comforting fact is that the “Child Bride Village” is changing. Today’s generation of “child brides” have begun to question the practice, and are shedding outdated customs and seeking freedom in marriage. Villagers no longer categorically criticize “child brides” who resist imposed marriages as unfilial ingrates. They instead concede that marriage should be left to young people to decide for themselves. 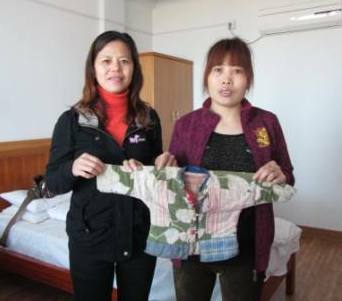 WRIC volunteers Su Changlan interview a child bride, the child bride show her old broken coat that was her wore by trafficked to Putian Fujian.